Jeepform games have a mysterious rap, perhaps because the Nordic games in general defy neat taxonomy, and this is the most definable word that’s made it over here. In the course of my travels, I’ve heard gamers drop “jeepform” to describe any roleplaying game that comes out of the Nordic countries. For indie gamers, dropping the neologism works a bit like mentioning Belle & Sebastian did back when I was in college — it identifies the hipsters to one another; it functions as a code word for people who are in to serious roleplay, even if they aren’t quite sure what it means. Well, my beloved gaming hipsters, I’m here to explain what the #$%! jeepform is to you…at least what I’ve gleaned during my travels. 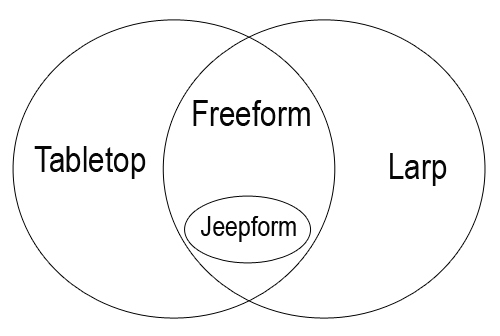 Jeepform is a style of freeform game. What in tarnation is a freeform game? That’s a good question — ask three Nordicans and you’ll get five answers. More or less, the freeform scene developed out of the tabletop gaming scene and now centers around the Fastaval convention in Denmark. Basically, people started standing up and acting out their characters during tabletop games, and things progressed until suddenly there were no tables at all. Freeform games use some techniques from larp, like acting out your character, and some techniques from tabletop games, like fast forwarding through the two-week trek you take to the dungeon. Think of it this way — in a platonic larp, there’d be a one-to-one relationship between reality and the game world. So if I bought you a mug of ale, we’d go to the inn and I’d buy you a mug of ale. In a tabletop game, there’s a symbolic relationship between the real world and the game world. So if I stab your character, I represent that by saying “I stab your character.” Freeform games use some one-to-one correspondence — if I shout at you in real life, I’m shouting at you in the game — and some symbolic relationships — I can make my pen into a sword if necessary. Because freeform games (and by extension, jeepform games) came out of the tabletop scene, folks refer to them as tabletop games. So jeepform is not larp, even though you act out a scene physically. Most of the games are for 3-8 players and can take place in any room with a reasonable amount of privacy and space. No set or costumes required. Jeepform is whatever the collective of (mostly) Danish and Swedish people say it is. The jeepers get to decide what counts as jeepform. Inducted jeepers make jeepform games. Other people can create jeepish games, but really, if it’s not on the Jeepen.org website (with rare exception, as pointed out in the comments), it’s not a proper jeepform. This is sort of like how if I made a phone with a touch screen it wouldn’t be an iPhone unless Apple said so. Or how if I slap LV logos over a kicky purse I designed, it’s not Louis Vuitton unless the company says so. Certain themes characterize jeepform games. For the most part, they’re set in the real, mundane world. No dragons here, just ordinary people having ordinary problems with their relationships, jobs, and personal lives. Linked to this is the idea of playing close to home — playing characters with whom you have something in common. Playing close to home also means making the story emotionally relevant for yourself by bringing your real life into the game. If I’m playing a relationship game and choose to riff off of that fight I had with my husband last week, that creates a very different play experience than playing on an issue that’s alien to me. Playing close to home can cause bleed, which is what happens when player and character emotions get mixed up. In the US, we often think of bleed as something to be avoided, but in many Nordic roleplaying games, it is encouraged and managed by the game formats. Playing for bleed can lead to insight about oneself and the world, and it creates intense emotions that some players crave. Since these game experiences are more about the emotion (the inside story), and less about the plot (the outside story), their surface stories often don’t have a lot of bells and whistles. For example, a game might be about a Mother’s support group that turns vicious, or a relationship where at least one of the partners experiences temptation and doubt, or about a drunk guy dying from alcoholism. It’s not uncommon to know how the story ends before the game begins, because the point is not really to discover what happens, but rather, to explore the themes and emotions suggested by the scenario. Similarly, because many of the jeepform games — but not all — encourage bleed, character sheets are minimal or nonexistent. If all I know about my character is that she’s an actress, then during the game I’ll necessarily fill in from my real-life experience, creating a character relevant to my life. While bleed can sneak up on you, it’s important to remember that players have some control over how close to home they want to play it — you can choose to create a character, a mask, between yourself and the game, or you can try to play it as if you were in the game situation. Jeepform games are highly structured. Most scenes focus on a couple of characters. Anyone who is not playing in a particular scene either watches the drama unfold, or perhaps enters as an NPC to help the spotlighted characters explore their emotions. Monologuing. During a scene, the GM can demand a monologue from a character by pointing and saying “monologue.” The character delivers a soliloquy about what’s going on in her head. When the monologue is over, game play resumes as if no one on stage has heard it. Monologues help flesh out characters and relay important information to other players. If I mention my character’s infertility during a monologue, then later perhaps my co-players will push me to address this by repeatedly bringing up children. As jeeper Emily Care Boss once told me, monologues and several other metatechniques often create dramatic irony between players and characters. This can be played for laughs — for example, two characters are flirting and one delivers a monologue about how repugnant the other’s breath is — and also for complexity/tragedy — for example, when a character delivers a monologue about how he’s thinking about cheating and then returns to a lovey-dovey scene with his wife. Bird-in-ear. The GM whispers stuff into the ears of characters to push them, either by offering direct suggestions or simulating thoughts that might be winging through the character’s mind. Telegraphing. You can bring any object you need into the game through the power of your imagination. The best way to do this is in-scene, for example, by saying, “I bought you flowers” when presenting someone with a pen. The phrase telegraphs to them that the pen now represents a bouquet. It’s also possible — but less elegant — to do out of game, by saying, “this pen is a knife,” and using it appropriately. Temporal play. There is probably some more official-sounding word for this, but many jeepform games play with time. GMs can fast forward a scene to two beers later. In some games, it’s possible to play flash backs and flash forwards, often using different physical locations in the room to help everyone keep track of the present. Character nonmonogamy. Several people may play the same character. For example, if two players are on stage and the GM calls for a possible future, two other folks might get up and play it out. Or we might play different aspects of the same character, as in the game Doubt, where two player portray actors in a relationship, and two players portray the characters in the play that they’re performing in. Where does the name jeepform come from? The jeepers put out many apocryphal stories about the term’s origins. The best way to hear one is to buy a jeeper a beer. Emily Care Boss and others ask Tobias Wrigstad questions on StoryGames. Tobias Wrigstad on designing jeepform games on StoryGames. How to approach a jeepform game on StoryGames. This entry was posted in Blog, Greatest Hits, Larp and tagged Doubt, Emily Care Boss, Fastaval, Frederik Berg Østergaard, freeform, jeepform, jeepform for noobs, Larp, larp theory, metatechniques, nordic larp, Nordic Larp Wiki, Previous Occupants, Tobias Wrigstad, Vi åker jeep by Lizzie Stark. Bookmark the permalink. Well done, Lizzie. Clear as a bell. Larp (acting things out) + table top (framing scene by scene, with a linear story experienced by all) + psychodrama (play with intent to express or focus on strong emotional impact) = jeep. Not historically (Lizzie outlines the steps that occurred here), but content-wise? Sure. Nordic freeform and improv are perhaps kissing cousins. I’d be surprised if psychodrama and improv aren’t part of a lineage. Looking at their histories (Spolin & Moreno), the timelines overlap. Both have that emphasis on spontaneity that…is challenging. Way harder to play than when you have pre-existing or collaborative story. Very nicely explained, Lizzie! One correction, though: It’s completely possible to create “properly” Jeepform games that are not hosted on the (now quite rarely updated) site. Solid examples of this include several great scenarios by Nathan Hook, and the brilliant “Hold Someone Liable” by Florian Berger. This is very helpfully to me as I know I was using these terms incorrectly at intercon (as Lizzie saw at the drinking larp). Very interesting, and well explained! Now I wonder if Fiasco took some of its hints from Jeepform. Regardless, I think the Fiasco rule set would be a great one for Jeepform. Great article. Captures Jeep succintly. As a Dane with roots way back in freeform, I constantly have to pinch myself in the arm, wondering why this isn’t taking of more in the rest of the world, particularly the US. It certainly isn’t because Americans are less inventive than Danes. I also don’t think Americans are any less emotional and touchy feely than Danes. So… why is it ?